Hailing from Finland, Atrum Tempestas is a stormy, yet tranquil trip into atmospheric black metal, drawing influences from styles like funeral doom and post-rock. The band has recently signed a deal with the Portuguese label Nordavind Records and their debut album “Néant” will be released on October 13rd in CD and Digital format. 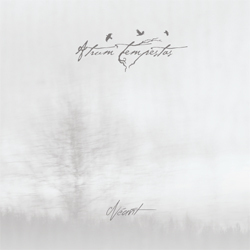 Since its foundation in 2007, Atrum Tempestas’ music has been shifting from deliberate minimalism to alluring soundscapes and from thoughtful examination to bursts of emotionally charged passages. Lyrically “Néant” derives both from personal experience, as well as more abstract themes of loss and nature, being the band’s first foray into crafting a conceptual whole. Here’s a commentary from the band on the signing: “We are glad to announce that we have signed to Nordavind Records for the release of our first album. Needless to say, we are very excited to be working with Nordavind Records, who, with their continued support, will give our music a fitting home. We can hardly wait for you to hear and see the fruit of this partnership, and hope for positive things to emerge in the future for all parties involved”! Cover artwork and album tracklist are already revealed.